Travel in luxury and comfort, flying over the traffic and leaving the ‘modern world’ behind. Events at Goodwood are always popular and none more so that Goodwood Revival. As we experience a late rush of bookings for Goodwood Revival please call our Operations Team as soon as possible to arrange a charter, or get an instant estimate with the form below..
Land directly at Goodwood Revival and step back in time with an event that brings a glorious selection of vintage cars and airplanes to the famous motor racing circuit. And what makes it even more special is that almost every spectator, participant and staff member is dressed in period costume. If you have ever wondered what it would be like to live in the 1950’s or 1960’s then Goodwood Revival is for you. Thousands of people attend this popular event and even though every other car seems to be a classic motor, the queues can be make the day start frustratingly slow. This is the only event of its kind to be staged entirely in the nostalgic time capsule of the 1940s, 50s and 60s so it makes sense spending more time at the historic motor racing event and less time travelling. This year they will have a nine-hour race, classic Ferraris and a wonderful selection of vintage airplanes. It is the sights and sounds of a bygone era and Atlas Helicopters can take you to the Goodwood Revival in luxury and comfort. You’ll enjoy views of the Hampshire countryside slipping below as you fly over the traffic to leave the ‘modern world’ behind. And once you step out of our aircraft dressed in your period costume you’ll join motorsport luminaries such as: Sir Stirling Moss, Richard Attwood, John Surtees and Derek Bell to celebrate wheel-to-wheel racing around the classic track: a circuit that has remained true to its heritage. Benefit from the flexibility that using a helicopter gives you. You can be collected from your lawn, or a site near your home or office and can choose your departure times. Should you wish to leave Goodwood earlier, owing to the weather, or stay longer than originally planned you will be able to do so. You will not have to rush off at the end of a memorable day simply to avoid the traffic queues on the way home. 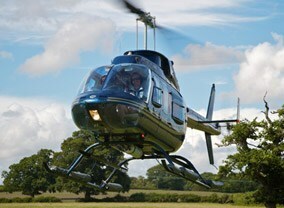 Using a helicopter means you can top and tail a memorable day with a flight that makes you feel part of the occasion. To arrange your Goodwood Revival helicopter flight telephone our events team now on 01256 635000 and we’ll take care of the arrangements.